FORT LAUDERDALE, Florida -- The first and only scheduled Florida U.S. Senate Debate between U.S. 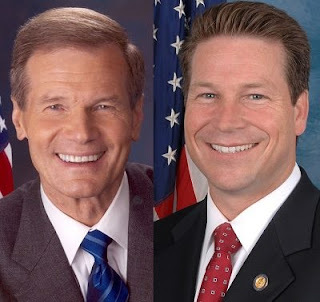 Senator Bill Nelson (D-FL) and U.S. Representative Connie Mack IV (R-FL) will take place tonight beginning at 7 p.m. Eastern Time / 6 p.m. Central Time. The debate can be watched on TV in Brevard County, Florida and east Central Florida on CBS Central Florida affiliate WKMG 6 (WKMG-DT 6.1), Brighthouse Channel 6 and 1060 (HD). Viewers can also watch the Florida Senate Debate tonight online on the NBC South Florida affiliate's website WPTV.com. The most recent Real Clear Politics average of polls has Nelson with a comfortable lead over Mack at 47.5% to 40.8%. So this debate may be Mack's only chance three weeks before Election Day for a break out in the U.S. Senate race.